Spencer Seabrooke is what’s known as a ‘slackliner’. Similar to tightrope walking (but with a slacker line, obviously), this highwire walking requires a daredevil attitude and level of concentration found in about 0.01% of the population. Seabrooke has it. But he almost lost it recently. He almost lost EVERYTHING. 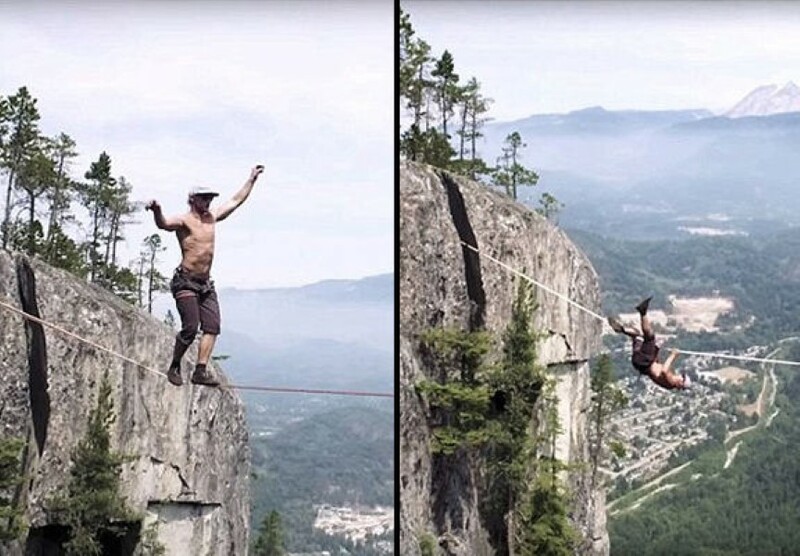 950ft up in the air, he was attempting to break the previous world record walk of 210ft across the chasm in Squamish, British Columbia. His line was set at 217ft. But just 20-odd seconds into the walk, disaster strikes! This is madness right here. We can imagine that it’s a rush. An adrenaline shot like nothing else. But so, so dangerous… As you’re about to see. Next articleMan Turns Humble Shed Into The Coolest Home Cinema EVER!